If you live for low end and you don't want to spend more than around $100, you'll love these. Otherwise, there are better options. While this is definitely an interesting idea, whether or not it’s a good idea is an entirely different matter. For the verdict, read on. Opening the box the first thing you’ll see is another piece of cardboard holding the quick start guide. Underneath this you’ll find the headphones. Along with the headphones themselves you’ll also find the included cable with remote and mic, carrying case, and a AA battery. Yes, even though these are standard headphones, you’ll need a battery. More on that later. The design of the Skullcandy Crusher somehow manages to be a little on the boring side despite all the faux-chrome and the skulls everywhere. It might have something to do with how thick and chunky they are. Put these on, and you look one pair of aviator sunglasses away from being a helicopter pilot in an ’80s action movie. To make sure nobody forgets who made these headphones, the band prominently features embossed Skullcandy branding. Aside from this and the aforementioned skulls, they’re fairly subdued looking. At least they’re pretty comfortable. The ear cups rotate slightly to provide a proper fit and the band is fairly adjustable. For moving the Crusher around, they’re fully collapsable. We would have preferred to see at least a semi-hard case instead of a fabric bag at this price, but the bag will at least keep the headphones clear of dust. You might look at the Skullcandy Crusher headphones and think, “what connectivity?” True, these aren’t Bluetooth, but they aren’t relics of the 1970s either. The included cable features a barebones one-button remote and built-in microphone. This is enough to pause and resume audio playback and to answer and end calls, assume you’re plugged into a phone. The mic is decent, and certainly good enough for the occasional call, but given the size of these, it isn’t likely that you’ll be making call after call using these headphones. And yes, the absurdity continues. Why do these need a battery? The answer lies in the low end. While the Skullcandy Crusher headphones will work without the battery, they won’t work as intended. The Sensation55 driver that provides the bass that gives these headphones their name requires a single AA battery, placed behind the left ear cushion. Luckily you won’t have to change it very often. Skullcandy claims 40 hours of playback from a single battery, and that’s with the bass slider set all the way up. It isn’t certain how much battery is saved by pulling the slider down a bit, but at least you never need to worry about the sound disappearing entirely. 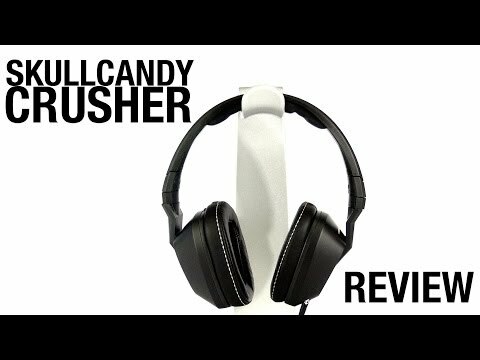 As mentioned already, the Skullcandy Crusher headphones utilize two different drivers. While the Sensation55 provides the sound and feel of the low end, the REX40 driver provides everything else. In addition to the multiple drivers, these headphones are also acoustically ported, to further increase bass and reduce distortion. The lows are, of course, the main event when it comes to these headphones. Skullcandy makes a big deal of mentioning that you can feel the bass, and this isn’t just a marketing gimmick. The Sensation55 driver isn’t a traditional speaker. Instead, it creates mechanical vibration, meaning that which those low notes hit, it sends these vibrations through the headphones and, additionally, you. For the most part this is very cool. Using the adjustable slider the bass can range from mild to absolutely massive depending on your preference. The only issue is that what bass is accentuated varies depending on how the music you are listening to is mixed. Mostly everything had a deep satisfying low end, but I did run into a few songs where just the kick drum was accentuated, for example. As we move up the frequency range, the results are more of a mixed bag, but the mids are the weakest point by far. The midrange throughout is flat and uninteresting, though the lower mids are the best defined. There is a surprisingly boxy quality around the 800 Hz – 1 kHz area that, in headphones clearly aimed at bass enthusiasts, I would have assumed would be more subdued. It is possible that this area is given a bump to help vocals stand out with the bass slider maxed out. Moving into the high end, things improve dramatically. The highs are crisp and clear, without going so far as to sound harsh. While its obvious that the highs weren’t treated with the same loving care as the low end, there is still a lot to like here. Looking at other aspects of the sound, the soundstage is fairly narrow. While stereo separation is apparent, it isn’t especially highlighted. For a lot of people buying these headphones (i.e., bassheads) this shouldn’t be a big deal, but it is worth mentioning. As for distortion, the acoustical porting certainly hasn’t done any harm. I pushed the volume up fairly far with no audible distortion. It’s possible that these start to break up at the absolutely highest levels, but at those volumes, so would my ears. Looking at whether or not to recommend these, I would have to ask a few questions. The first would be “do you like bass?” Assuming the answer is yes, the second question would be “do you REALLY LIKE bass?” If so, you have probably just found your new favorite headphones, especially in the $100 range.